Taco lovers, have you tried a Mexican Taco Bowl? It is a healthy and easy take on the original and much less messy! It doesn't take too long to throw together, especially if you have rice at the ready. Cook it up for the family for a refreshing summer dinner. Alternatively, prep it on Sunday for a few lunches during the week. These toppings for the bowl are delish but you can change it up with whatever you fancy: substitute rice for quinoa, add some mixed lettuce leaves, or top with vegan cream cheese instead of cheese and sour cream for a dairy-free meal. Let fussy eaters choose their own toppings or eat it deconstructed. It's a great meal to eat on the back deck on a warm evening and another bonus is that there's not much washing up. Buen provecho! Heat some oil in a pan on medium heat and add the corn kernels. Salt the corn and cook for a few minutes. Remove to a bowl and add a little more oil to the pan. Add the beef mince and tomato and cook until browned. Season with cayenne, salt and pepper then add the water. Sautee for a minute then remove to a bowl. Next, arrange the rice, mince and corn in the bottom of a bowl. Finally, top with cherry tomatoes, avocado, cucumber, snowpeas, grated cheese and sour cream. 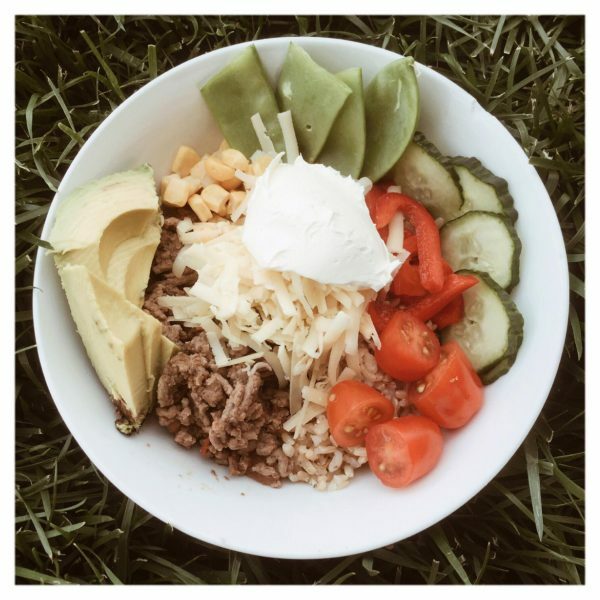 This entry was posted in Recipes, The Organic Place and tagged familyfriendly, healthyrecipe, kidfriendly, Mexican Taco Bowl, organicbeef, organicmeat, organivegetables, recipe, recipes, Taco Bowl, The Organic Place.